It seems to have now become something of a tradition for Gap and GQ to do a crossover release of a bunch of clothing from designer brands at around this time of year. The goal? Offer a taste of this designer clothing to the masses at reasonable, but by no means cheap prices. I’ve never gotten anything from these collabs in the past, but they’ve always been worth a look. This year’s collaboration is with United Arrows, Ami, and Kinfolk and was just released and is now available to order from. Things are very trendy this year, and there is honestly, and disappointingly, not a whole lot that I really like, or that is really a good choice for anyone interested in more classy or timeless looks. Nevertheless, there are a few nice pieces worth taking a look at. Note: Right now, at these prices, wether these items are worth it is up for debate. However, if you’re willing to risk the item you want selling out, these GQ collabs have indeed gone on sale eventually, so you could wait for that to get a much better deal on these items. A nice-looking, two-tone down jacket. Should keep you nice and warm during the colder months to come, and the color is extremely versatile; goes with just about anything. Should warn you, though, that it looks rather baggy on the model, so if you’re looking for a slimmer fitting jacket, either try sizing down (if that doesn’t result in a ridiculous fit otherwise) or you might have to skip this one. Not sure I understand what is 3-in-1 about this, but there is a real nice looking black inner jacket that you can wear separately, so you’re getting the 2-for-1 for sure. Versatile, good layering piece for the fall, and rainy days. 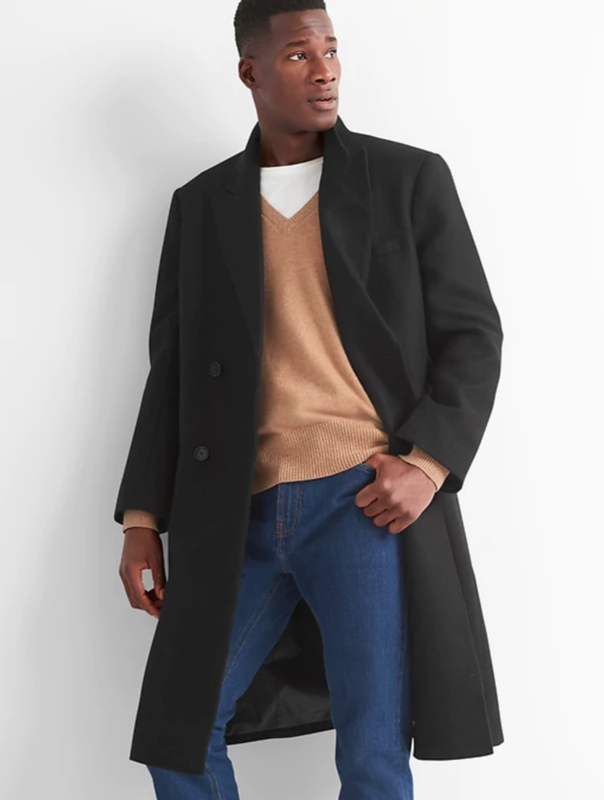 The longer coats are definitely more in style these days, and this is a great-looking option if you’re in the market for such a thing. Also seems to fit the model pretty nicely. Fair price, too. Very pricey, very fancy item to purchase from Gap. But hey, it is “designer,” so… If you like the double-breasted style, this is a nice, dressy coat to layer over a suit. Looks like it is not at all slim-fitting, again, though.